Spintropolis Casino will then reward you with a bonus (Welcome Bonus is for new players only). 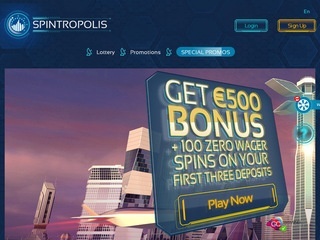 The terms and conditions of the bonuses vary between different casinos and might also change over time and between different countries, so it is important to compare the different offers and read the T&C for Spintropolis Casino before signing up. 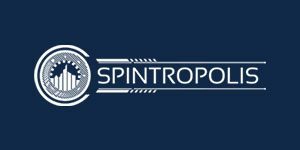 Established in 2017, Spintropolis is a new brand on the online casino market. It is founded and owned by Curacao-based Equinox Dynamic N.V. and its wholly owned subsidiary Domiseda & Partners, a company based in Slovak Republic. Offering a full range of casino games and boasting a futuristic appearance, the gambling site is a breath of fresh air on the market. It has games provided by some of the biggest names in the industry and is available on desktop and mobile devices. The mission of the gambling site is to bring you the top trending slots today and so far it seems that the good people of Spintropolis are successful in doing it. Slots on offer are well-organised into categories allowing visitors to choose ones to their liking by their key features. During your stay, you don’t have to worry about safety or fairness since the games are brought to you by reputable developers and the casino itself holds the licence issued by the Government of Curaçao. Slot enthusiasts can join multiple tournaments with large prize pools and promotions while collecting comp points for their loyalty on top of a generous welcome package. Its openness to customers from all the corners of the world Spintropolis shows by supporting different languages from English, Spanish and Italian to French, German, Russian, Swedish, Finnish and Norwegian. Your sensitive data will be protected by the latest SSL encryption technology employed by the casino. Players can enjoy more than 850 casino games at Spintropolis. They are all available in instant-play mode with no download needed thanks to the multiplatform it runs on. It is powered by a long list of software providers starting with the industry’s behemoths such as NetEnt, Betsoft and Play’n Go. Other developers supplying the casino with their products include Booongo, Fugaso, MrSlotty and Spinomenal, to name a few. Whether you like slots, virtual table games or live dealer tables, you can find a game to your liking in the Spintropolis extensive library. When you learn the name of the casino, you can easily tell that it focuses on slot players. They can enjoy a plethora of video and classic slot machines which make up dedicated sections. The Hot Games category is home to all time favourites such as Starburst, Book of Dead or Sugar Pop Double Dipped. In the Fresh Games section you can find the latest releases including Berryburst and Berryburst Max, Wunderfest Deluxe or God’s Temple Deluxe. The Booongo Tournament is a section dedicated to slot games you can play and take part in the competition for chance to win a share of the prize pool. A wide selection of table games is on offer including Blackjack, Roulette, Baccarat and Poker variants. Players who prefer a more traditional gaming experience can visit the Card and Table Games category and choose from dozens of casino games available at virtual tables. Some of them are Blackjack Players Choice and Blackjack Surrender, Chinese Roulette, Casino Hold’em Poker and Caribbean Poker. 3D Baccarat, Roulette and Blackjack by Irondog are available too. When it comes to other games, they are also featured in the Card and Table Games category. Players can choose from Video Poker variations such as different Jacks or Better games, the multi-hand version of Deuces & Joker Wild, Deuces on the Rocks and so on. In addition, a variety of Keno games are on offer including Instant and Jackpot Keno. If you join Spintropolis you won’t miss on fun at live tables either. The casino offers an Evolution Gaming-powered lobby with a range of high-quality tables. On top of that, you can join Blackjack, Roulette and Baccarat tables powered by Lucky Streak and Extreme Live. Roulette tables powered by Extreme Live follow the latest trend in the industry and combine the Roulette and slot gameplay providing players with a chance to hit a progressive jackpot. Spintropolis provides players with a smooth banking experience thanks to a wide array of deposit methods it supports. They include e-wallets like Neteller and Skrill, debit and credit cards like Visa Electron, Visa, MasterCard and Maestro and instant banking options such as Sofort and EcoPayz. The casino also supports payments and withdrawals in Bitcoin. The minimum withdrawal amount is €100 per transaction and players can cash out up to €5,000 per 30 day period. Withdrawals are typically processed within up to 3 business days. The casino accepts only EUR. Spintropolis prides itself on providing customer support 24/7/365. Customers can reach reliable agents via live chat, email or telephone. Send an email using the address [email protected] or make a call to the phone number given on the website. The casino also offers a comprehensive FAQ section answering to some of the most common inquiries. It is recommendable to visit it before you reach for any of support channels mentioned above.